Hello, friends…I hope you’re doing great. This past week has been a bit a flop, both literally and figuratively. I began Monday full of ambition and determination as I filmed a couple of videos, but upon reviewing them, felt none turned out quite right. 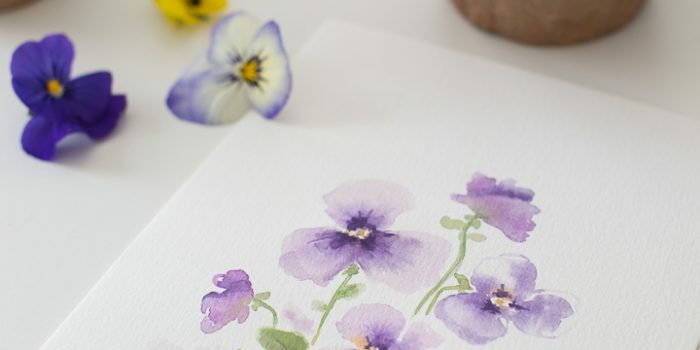 While a little discouraged, I decided to shift gears and work on some watercolor as that always lifts my spirits, but alas, I would be disappointed with everything I painted. No worries…tomorrow is another day, right? 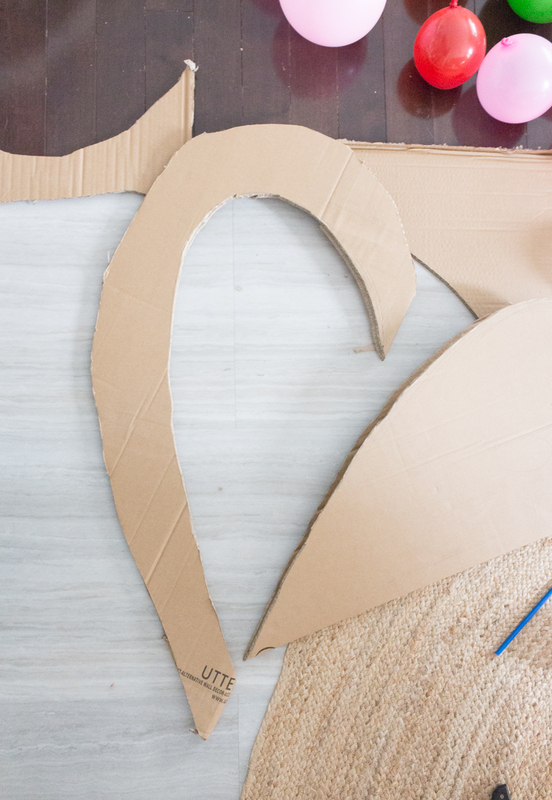 So on Tuesday, I decided to work on the heart balloon arch and it was only after blowing up all of the balloons and beginning to assemble everything that realized I had picked out the wrong colors and it did not look like I envisioned it. Sigh. 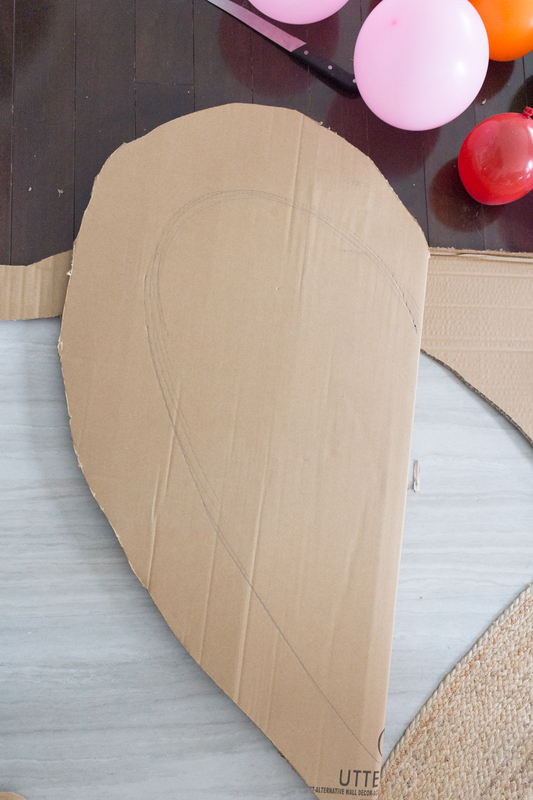 Okay…onto the next project which was cake baking, which admittedly is not my forte. I didn’t do myself any favors though by picking up the wrong cake mix boxes, but a cake is a cake, right? Apparently not. Have you ever tried to make angel cake? I’ve come to learn you need a special pan for them or something. And how exactly did I come to learn that you might ask? That’s right…the cakes literally flopped to the side as soon as I took them out of the oven (they may have even sighed while collapsing). I thought I was never going to get my little set up ready. 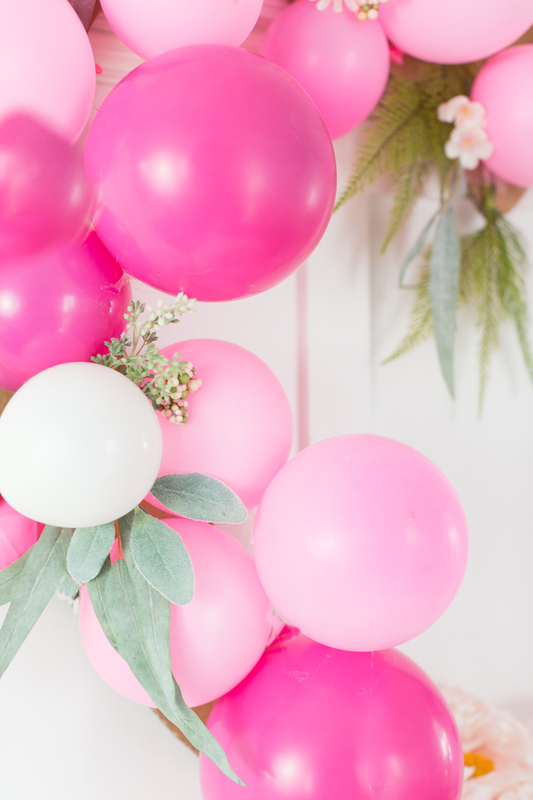 but thankfully things turned around and today my friends and I are sharing 11 fun ways to celebrate Valentine’s Day. 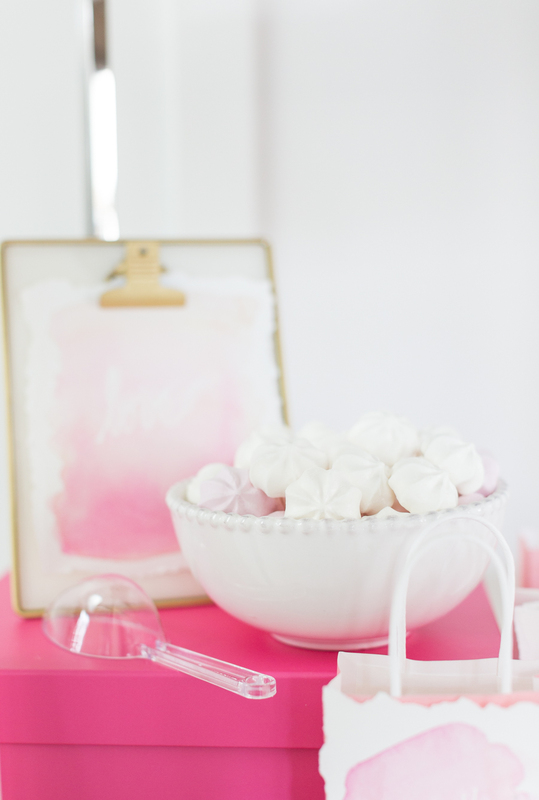 Did you see my friend Julie’s cupcake party? Sweet, right? 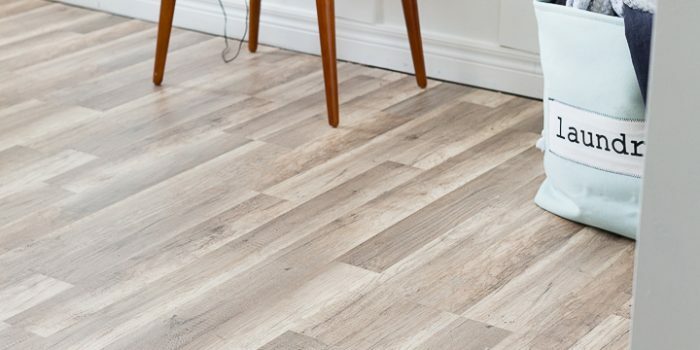 Please make sure you check it out and the rest of the amazing ideas (links at the end of the post). 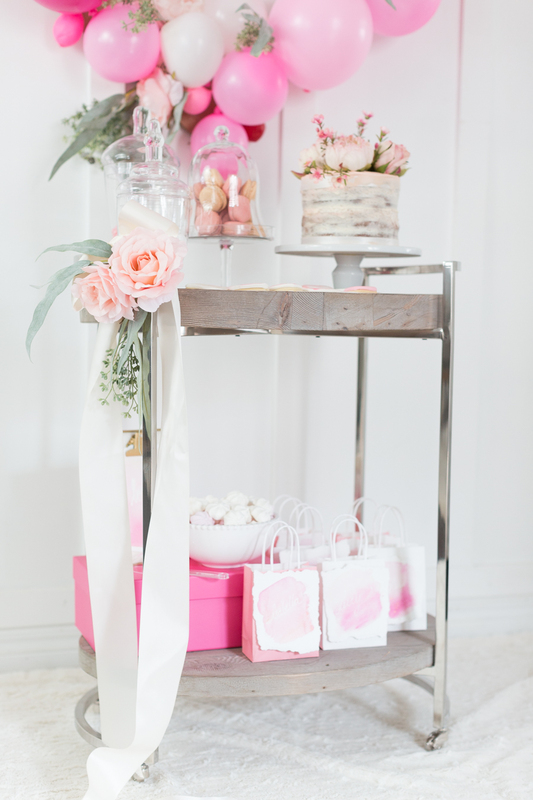 For my Valentine’s Day party, I wanted to do a cute little candy bar cart and include some cookies and a cake. I ended up baking two cakes from scratch, which was just fine with me as I need all the practice I can get. I think the cake turned out pretty cute, considering I have no clue what I’m doing when it comes to baking. I placed some pretty faux flowers from Michaels along with some real roses from the grocery store. 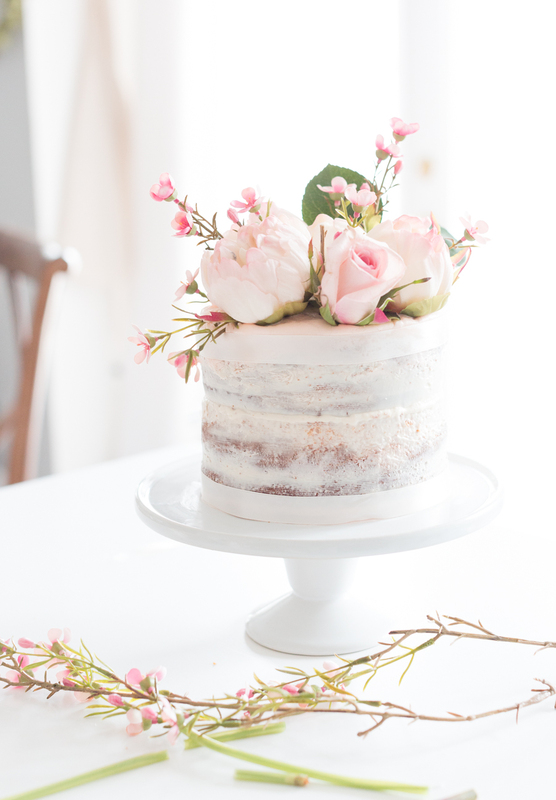 I’m still a little obsessed with the look of the naked cakes which works out perfectly for those like me who do not necessarily know how to frost cakes. Baking is going to be my downfall. 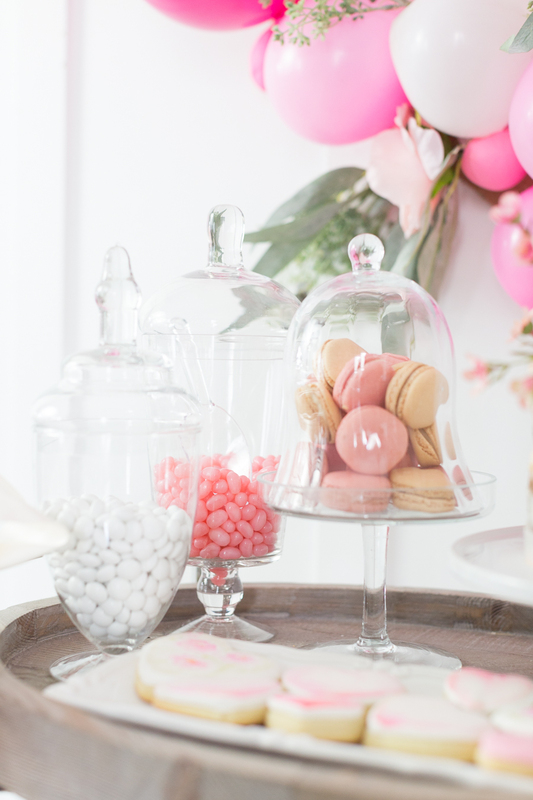 The cart is filled has different candies in apothecary jars, some macaroons, a couple of cookies and the cake. 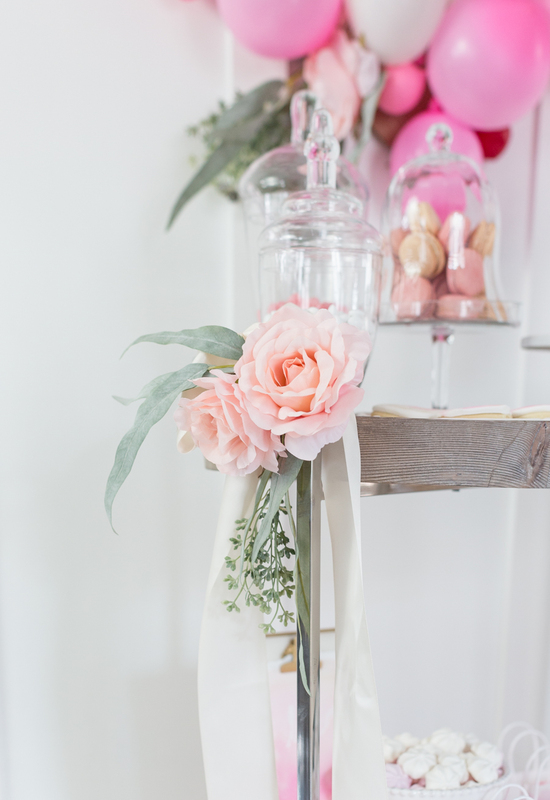 I decorated with some more faux flowers and some ribbon just to tie all together. 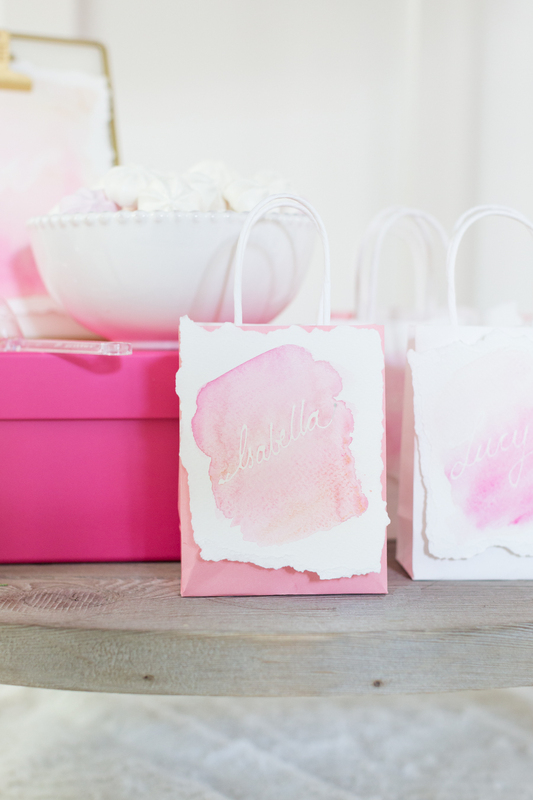 Theses little bags each – with individual name tags – will be used to hold the candy and the cookies. 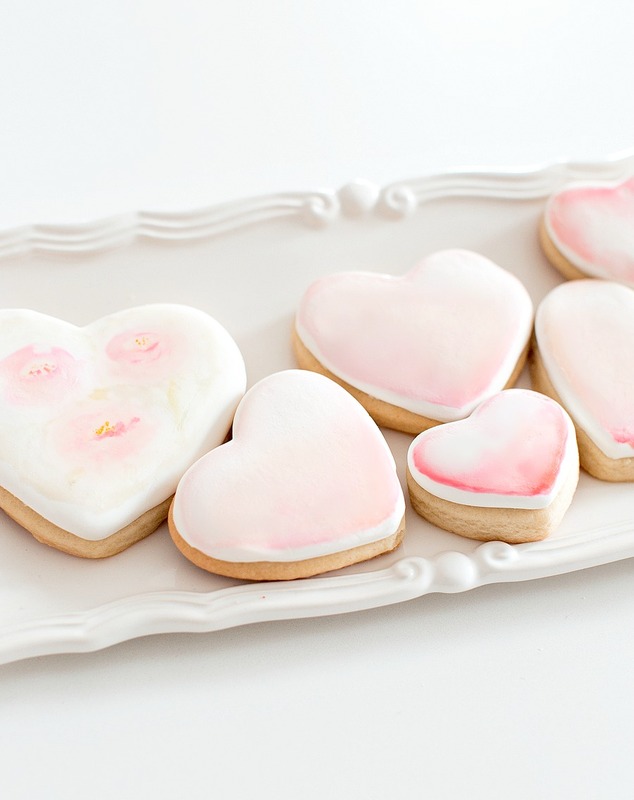 These sweet cookies are covered with fondant and painted with gel food coloring. You can see a tutorial of a similar process here. 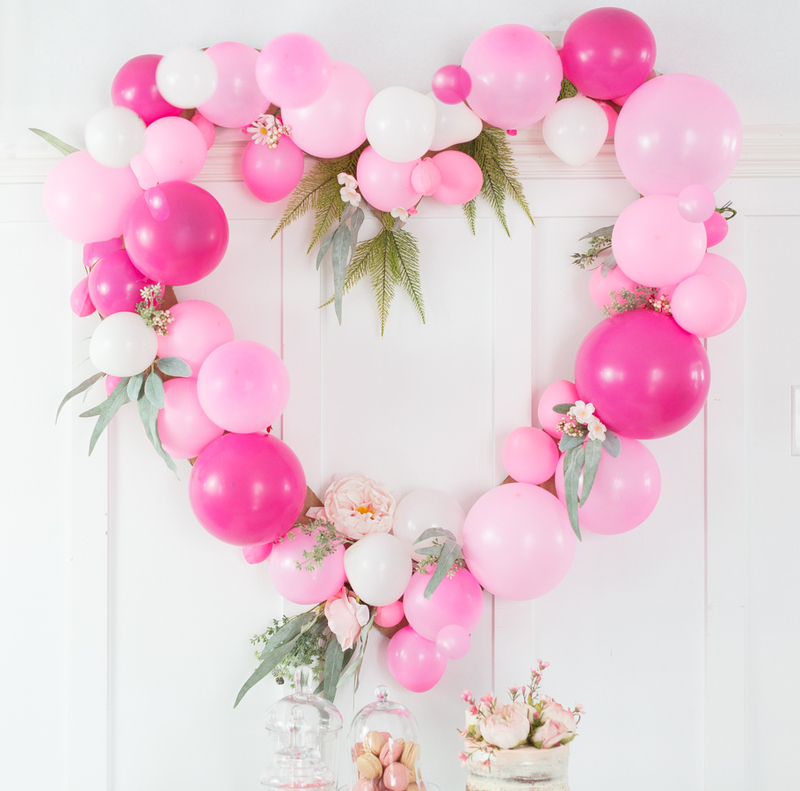 One of my favorite things about this set up is this heart balloon wreath. 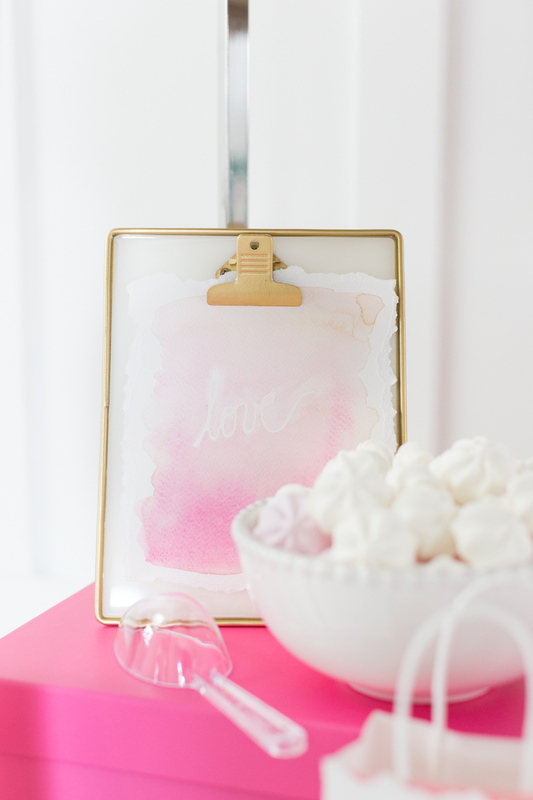 It’s light enough that you can use it as a frame and have your guests hold it in front of them for photos. 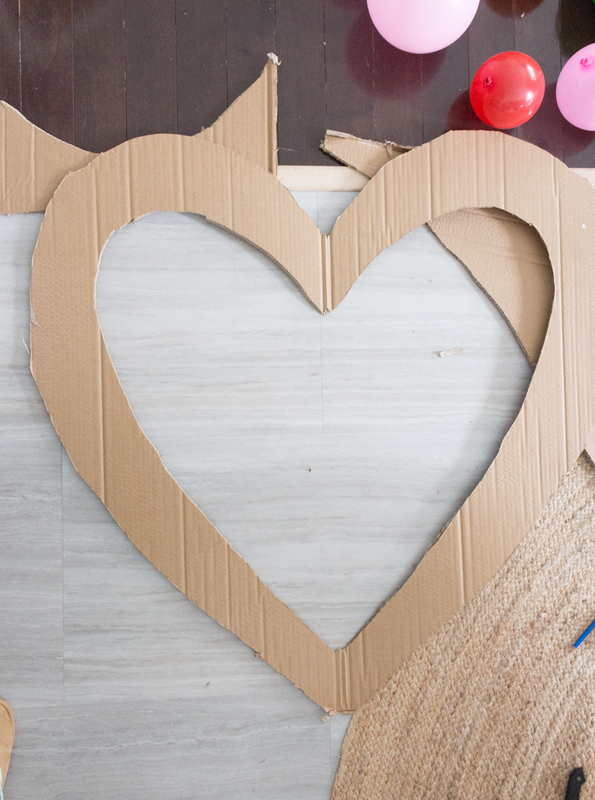 To make the wreath, I folded a large piece of cardboard in half and drew half of the heart (just as you would on a piece of paper). I used a sharp knife and cut along the line. I folded the heart again and drew an inner line. I then cut along the line. And there’s your heart wreath form ready. I then used a low temp glue gun to glue the balloons. 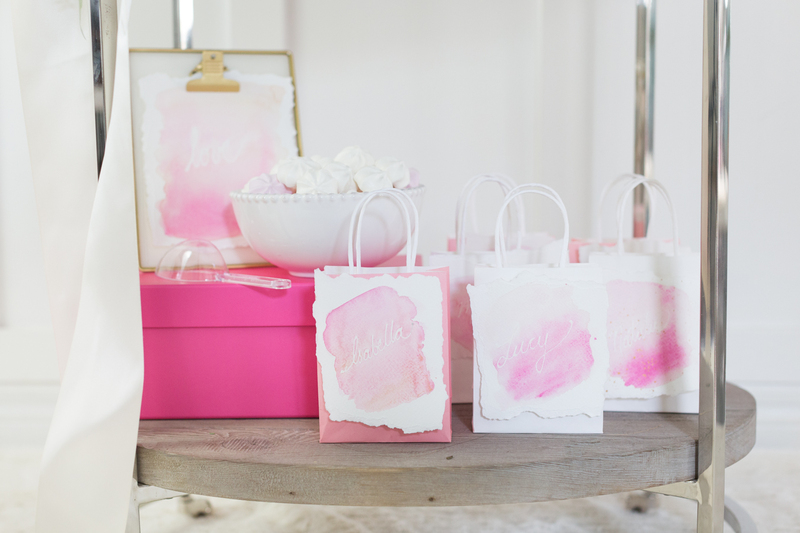 I had different shades of pink and some white, all in various sizes for more interest. 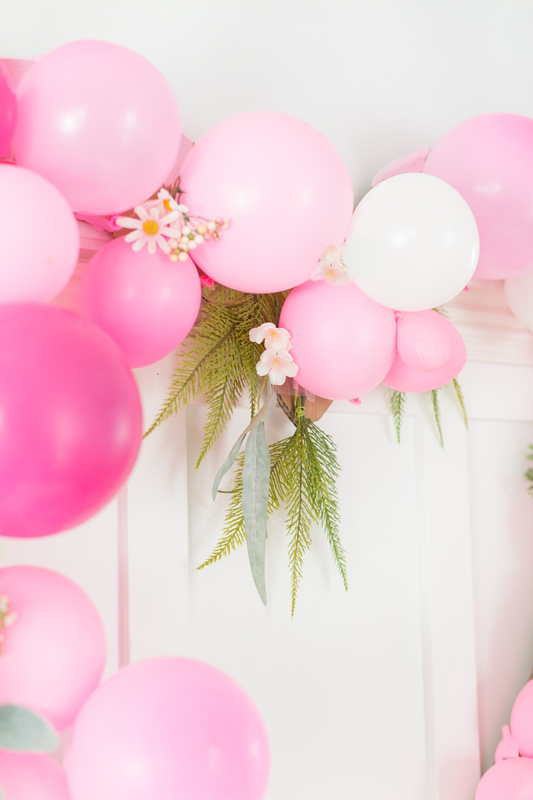 I added some florals and leaves around the areas not covered by the balloons. I probably should have painted the cardboard white to have it camouflage against the wall. 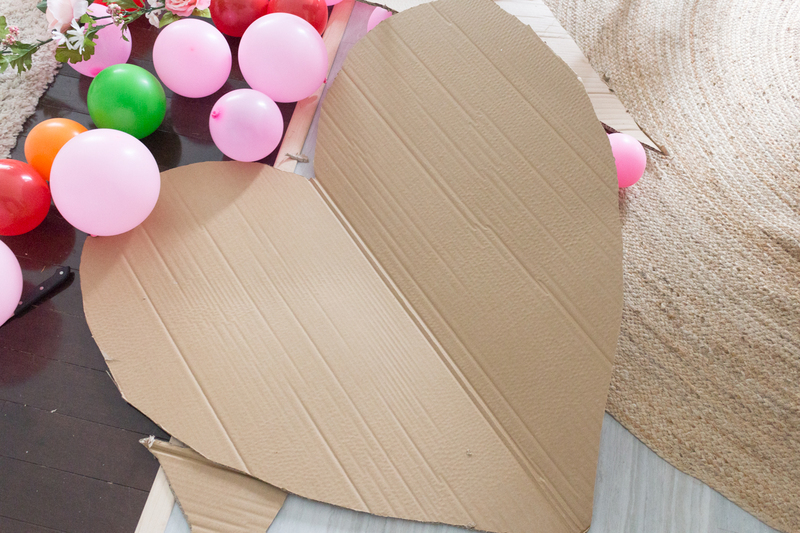 Alternatively, you can make a stationary backdrop and skip the cardboard altogether and just form a heart shape with the balloons and use tape to attach to the wall. 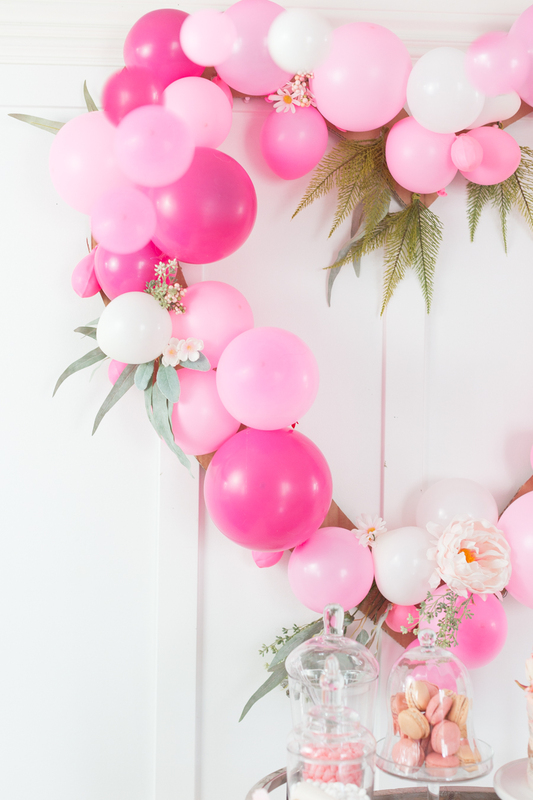 As an FYI, if you decide to make the balloon wreath, I would blow the balloons the day of if possible, or make sure you have extra balloons to fill in the gaps as I found that many of them were deflated in the morning. 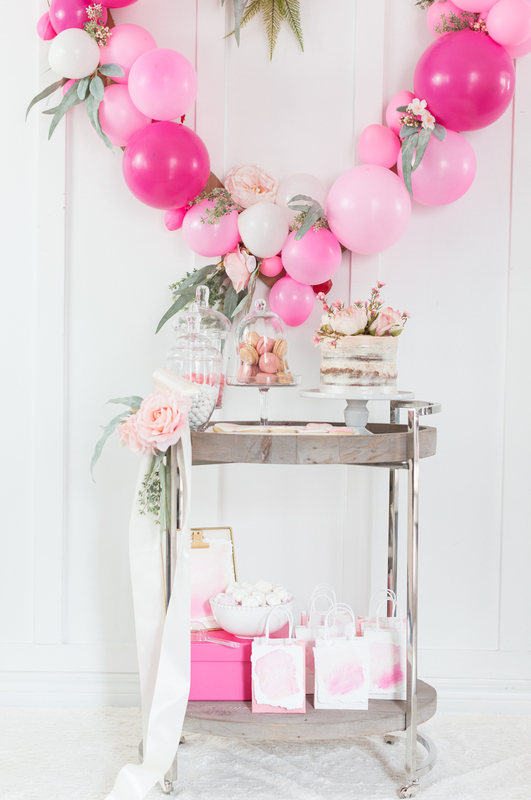 I think this little set up would work beautifully at any little girl’s party or even a baby shower, don’t you? 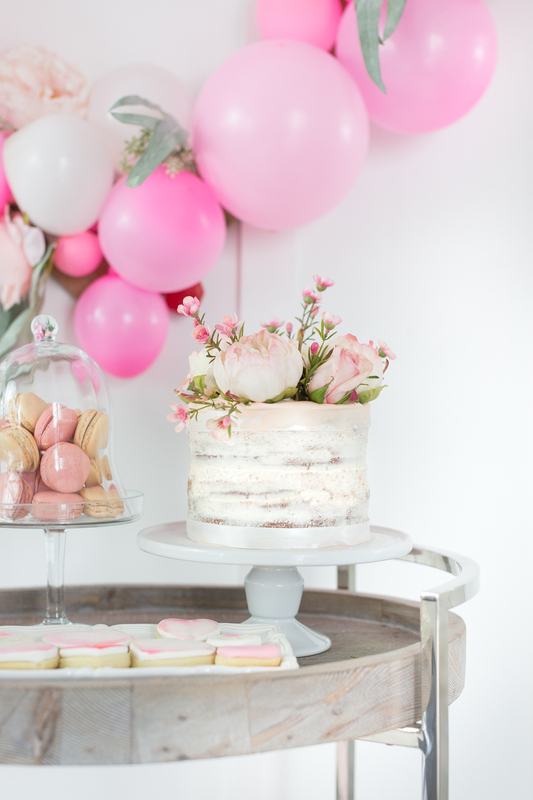 Please head on over to my friend Erin’s sweet party. 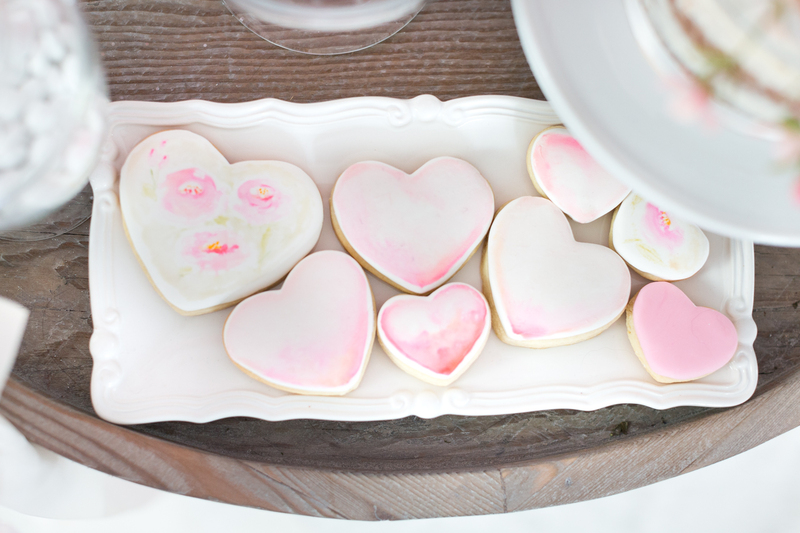 Thank you so much for stopping by, and don’t forget to check out the rest of my friend’s Valentine’s Day party ideas. So lovely, love the colors. This is beautiful!! 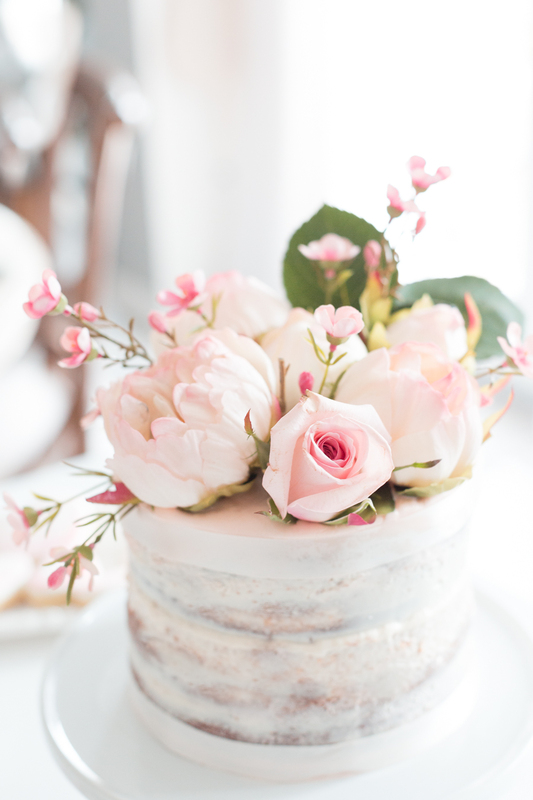 Every detail is so pretty, but that cake is absolutely gorgeous! Where is that bar cart from? I love it! Oh, Lucy! This is dreamy. Wow. You are seriously talented. I agree with Tammy. Filing this away for the next party. And that cake! So beautiful. Omg I love!! One day I’ll be ambitious enough to tackle this! For having so many mishaps, your persistence payed off! Man how I hate it when my projects don’t go as planned! 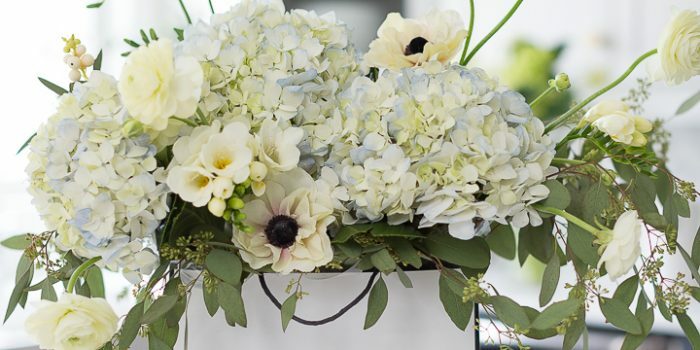 Such a pretty, pretty vignette! So inviting, uplifting and sweet all at the same time! oh wow!! you never disappoint! so much talent!! The wreath is gorgeous and those cookies! oh my! Just perfect! Oh Lucy! 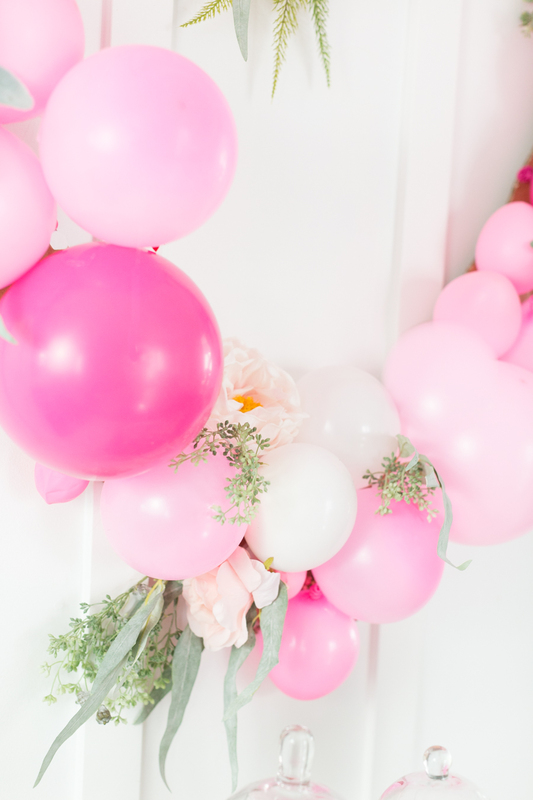 I just love how the heart-shaped balloons turned out! And honestly, the cake mixup, so something that I would do! Speaking of the cake, teach me your ways! 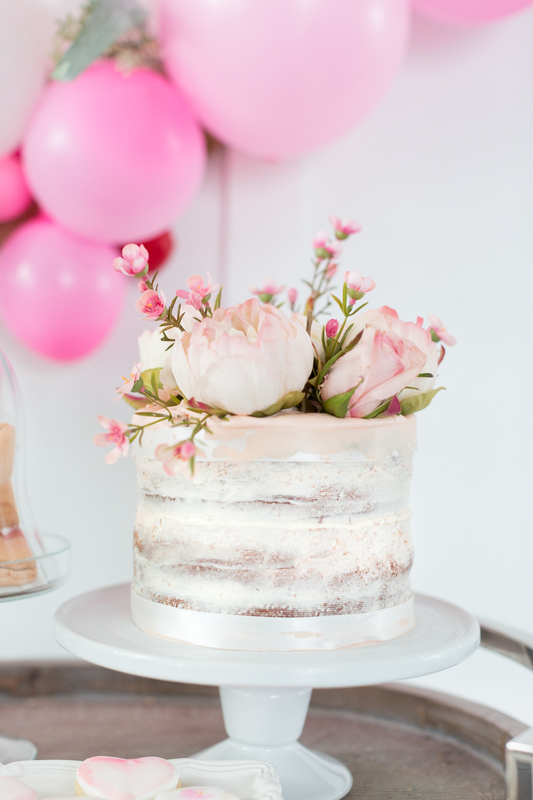 Love how beautiful the icing looks and the flowers are stunning! Beautiful Lucy, My jaw is on the floor. You always knock it out of the park!! Oh Lucy, no wonder God continues to bless you with more and more talent! You never give up…you persist and think of something new and turn a “fail” in your eyes into the most beautiful creation for the rest of us to swoon over! I can’t get over how lovely and perfect every detail is! Thank you for always fueling my creativity and inspiring me! Your kids are so blessed to have such a talented and fun mom! 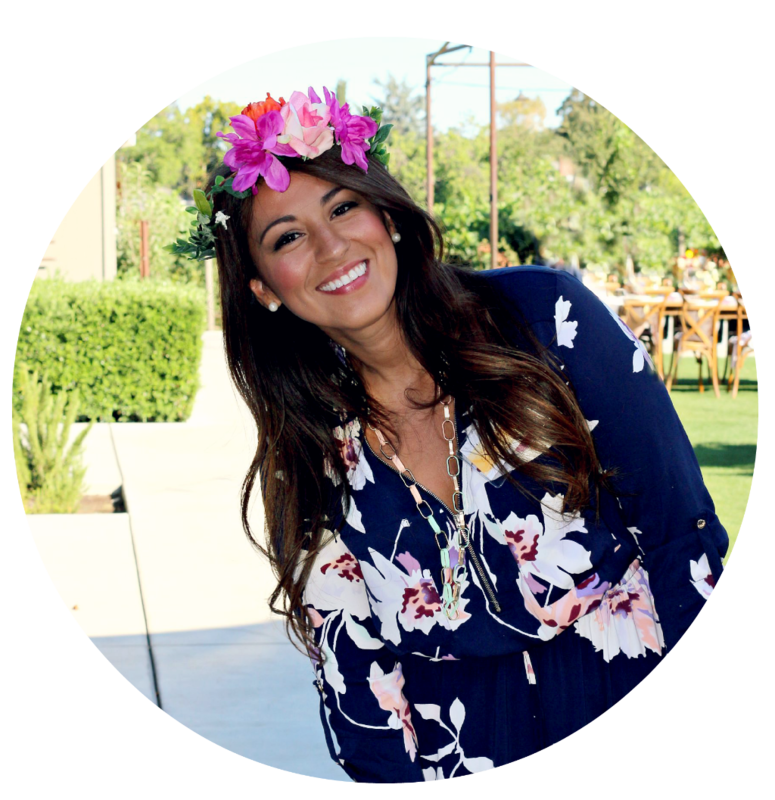 Thanks so much for joining me in another fun blog hop! Muah! 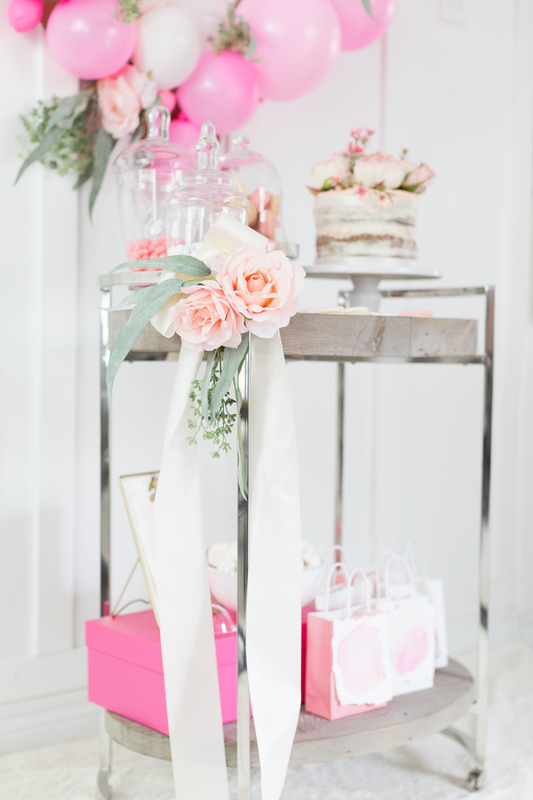 Lucy, I am in love with that heart-shaped wreath, so cute…and that naked cake, so on trend!!! Everything is lovely! Your optimism, despite the setbacks, paid off big. 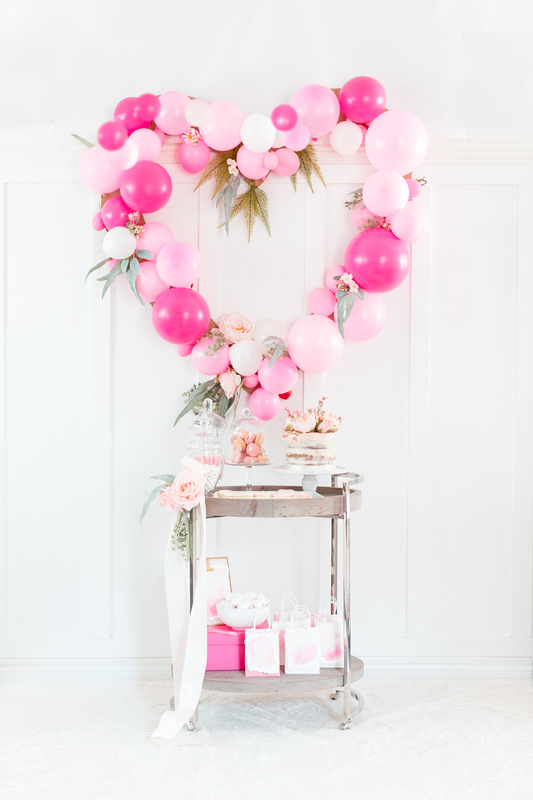 Love the Heart/Balloon wall wreath, but that cake loos to die for. Oh, love the bar cart/tea cart, too! Thanks for sharing your wonderful talents! Omg so in love with this! I might even put this up at my wedding!! 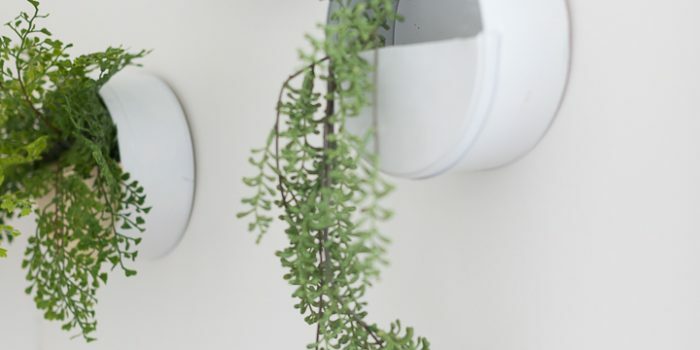 How did you hang it to the wall? You are quite the intrepid creative trouper, Ms. Lucy. 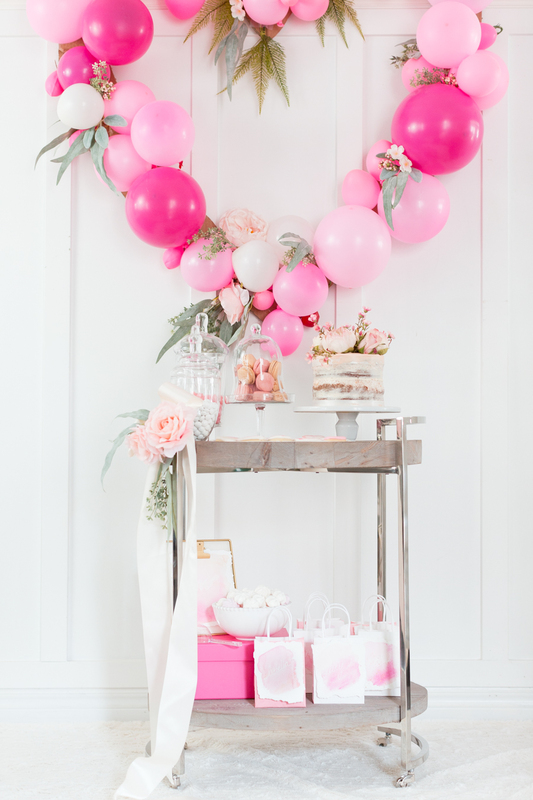 My jaw just dropped when I saw the photos of your balloon heart and naked cake. These beauties, and the ideas that did not take flight before them, remind me of the wisdom my artist-ex shared with me about my own art. He advised me to work on my skills every day, so that when inspiration hit I’d be able to bring them to life. He was absolutely correct. Plus, I learned early on that the creative process itself is as important and rewarding as any finished piece. I hope you thoroughly enjoyed making the gorgeous balloon heart and cake as much as we appreciate their beauty and your talent. What a lovely Valentine gathering this will be! 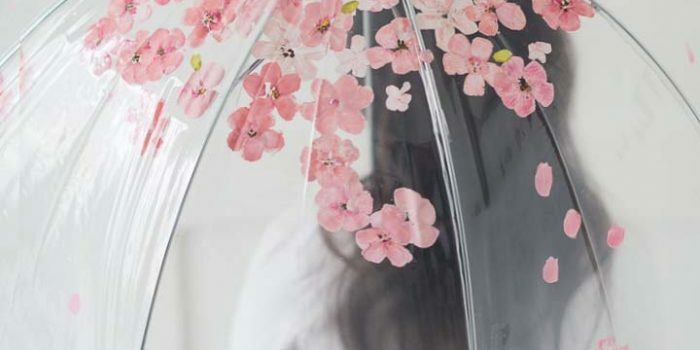 So many sweet personal handmade touches. Just lovely! This is a gorgeous post. 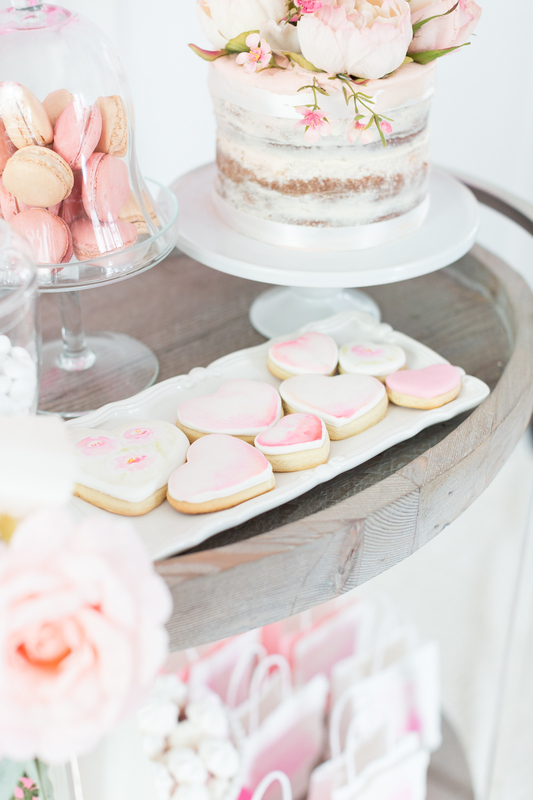 The dessert cart is beautiful Such beautiful desserts to choose from. 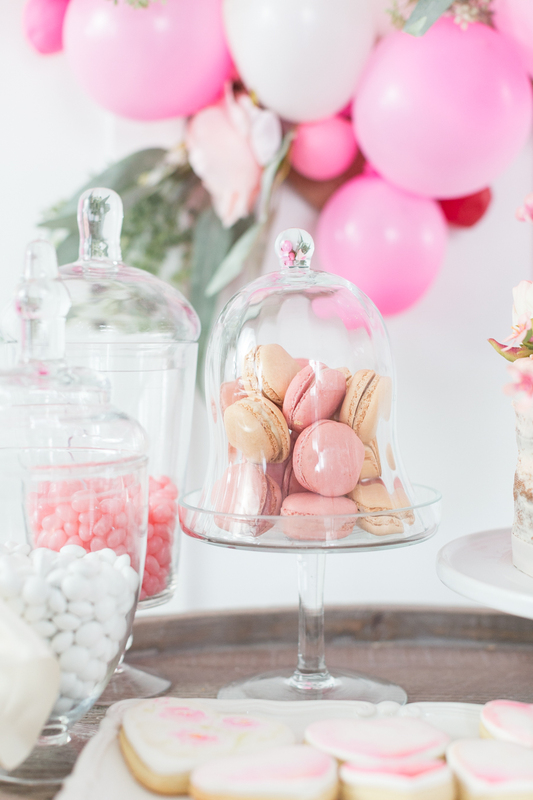 A beautiful cake decorated skillfully and that heart balloon wreath is so special. i would love if you shared this at our link party, Dishing It & Digging It. The party is live now. Happy Valentine’s day. This turned out so well!!! Just lovely. And I absolutely love your honesty about all the missteps. 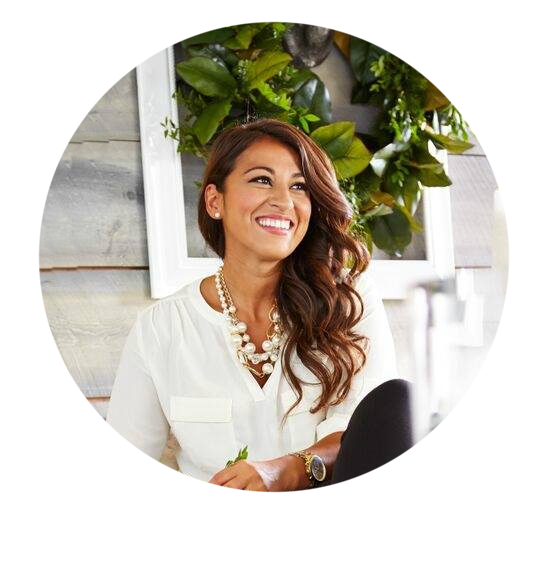 Any chance you can tell me where your bar cart is from? I’m in love.